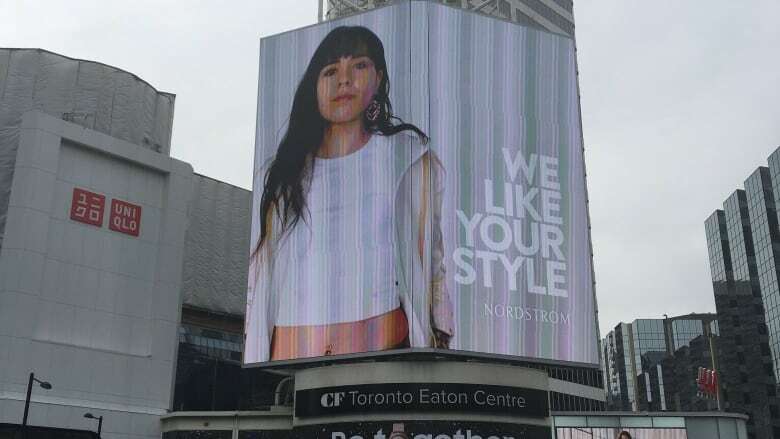 Tunchai Redvers, who spent her childhood in Hay River, Yellowknife and Fort Resolution, N.W.T., is a model in the We Like Your Style campaign for luxury department store Nordstrom. "It's honestly surreal," she said. "To be that person that I wish I had seen when I was growing up is just incredible." Redvers, who spent her childhood in Hay River, Yellowknife and Fort Resolution, N.W.T., is Dene/Métis and two-spirit. To Redvers, two-spirit is a term for Indigenous people who don't necessarily identify as straight or within the LGBTQ spectrum. "For me it's about more than gender and sexuality because it is inclusive of culture and spirituality as well," she said. Redvers is also a model in the We Like Your Style campaign for luxury department store Nordstrom. In a cream-coloured jacket and white crop top, Redvers can be seen standing tall and proud above the entrance to the Eaton Centre mall at Yonge and Dundas Square in Toronto. The Nordstrom campaign is meant to promote diversity and inclusiveness, according to the company's website. The department store made an open casting call for its spring 2019 ads, said Redvers, and she was one of eight people picked. The company wasn't looking strictly for models, said Redvers. "They wanted people or models who are also doing really cool things in their community." Redvers, who is not a professional model, fit the description. With her brother, Kelvin Redvers, she is a co-founder of We Matter, a national non-profit for, and led by, Indigenous young people. Through videos, poems and art, the organization shares messages of hope and support with young people who are feeling sad or thinking about suicide. In her Nordstrom photos, Redvers wears a red rubber bracelet — a symbol that she took We Matter's "hope pact." "This bracelet is a reminder that you are not alone," she said. "There are others who are out there standing with you, no matter how tough times may be." When she was young, Redvers used style as an outlet, a way to deal with "external pressures or dysfunction" around her. "By choosing what I got to wear every single day, I was choosing how I wanted to present myself, I was choosing how I wanted to be seen," she said. "That was really powerful for me, and so as I grew into my identity as a Dene and Métis person, as a two-spirit person, that stuck with me." When Redvers thinks about another young Indigenous girl, a two-spirit girl, looking up at her picture above the Eaton Centre, she fights back tears. She wants that young girl — a girl like the one Redvers used to be — to know that she is seen. "She can be anything that she wants to be in this world despite any of those hardships and struggles that are working against her," said Redvers. 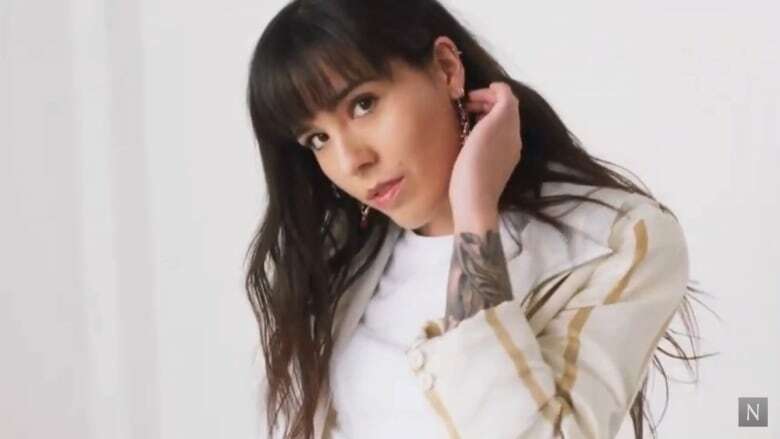 "She can be her authentic and proud self and that there are so many other Indigenous women and Indigenous aunties out there who are leading the way and wanting her to succeed."